I am enormously proud to announce the launch of a very exciting project I have been working on for some months now. 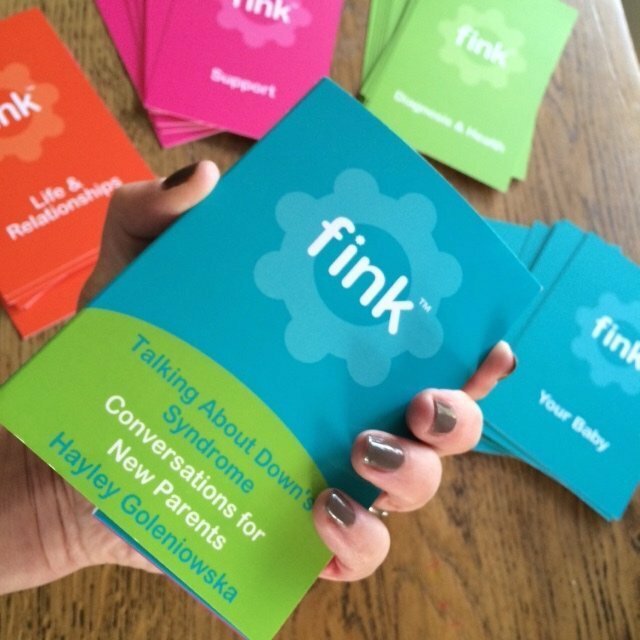 Talking About Down's Syndrome: Conversations for New Parents is a pack of bright colourful, portable cards. 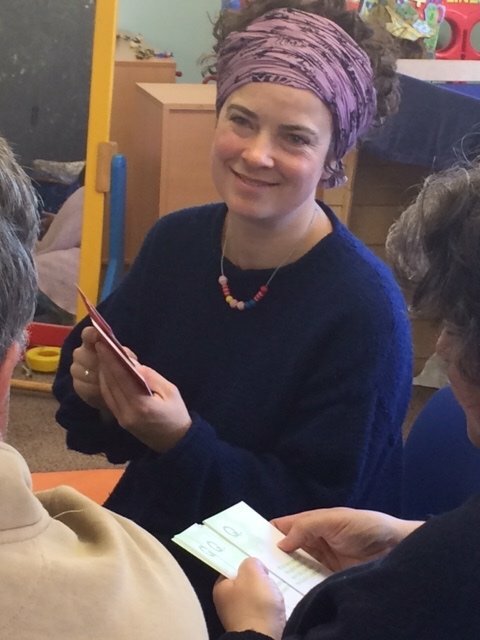 The cards are conversation starters, each one containing a carefully written question designed to get parents talking about the bewildering array of emotions, facts and myths that bombard them in the early days of their child's life. The Fink cards are the brainchild of Lisa Warner. She has published almost a hundred titles over many years, some packs for family chat, and others on more difficult topics like bereavement and depression. The concept is simple: questions that get people talking, questions that everyone can answer, questions that make us dig deeper, explore further and look at situations anew are invaluable at a time when people often close down. When Lisa asked me if I would write a set for her, I was so excited about their potential power that I had the first draft complete in one night. I simply sat and tapped into every emotion I had felt as a new parent, and posed questions that now come from my place of knowing, of hindsight and learning on the job. The questions cover life and relationships, diagnosis and health, your baby and support. I hope the cards will end up with Down's syndrome support groups, others will find a place in the bags of health visitors, portage workers and midwives, some will end up on the coffee tables of new families, one card at a time might be pulled out over dinner, drawing families closer to each other and their babies, or they might spark conversation with doctors at medical appointments. I hope too that the cards might form a part of the training of medical professionals, allowing them to reassess the way they view Trisomy 21. They could make such a difference to the support given to parents by sonographers and consultants for example if they were to read through them. So which 6 questions would you ask a new parent whose child has the diagnosis yours has? 1 - Was your baby with you when the diagnosis was given? It is so important for the baby to be present if at all possible when a diagnosis is given. We were told Natty has Down's syndrome while she lay in an incubator on a distant ward, which had the effect of making bonding more difficult initially. The syndrome came to the fore, rather than her being our beautiful, vulnerable daughter first and foremost. 2 - Did you have antenatal screening? Whether parents know of their baby's diagnosis antenatally or not might impact on the way they welcome them into the world. Each family has a different view of screening and its role for them. Sadly this is a question complete strangers will ask a lot, so its wise to have an answer ready. 3 - Have you found any books or leaflets particularly useful? There is so much support available, and so many wonderful resources produced by charities and other networks, even other parents. Parents at support groups will spread information on what worked for them and these recommendations are the best. 4 - What have you learnt about Down's syndrome that surprised you? There are very few parents that have all the facts and all the answers when they begin life with a newborn with Down's syndrome. I for one was surprised at my level of ignorance in the early days and have learnt much along the way. 5 - What is your baby's personality like? Each baby who has Down's syndrome is as unique as the rest of us. It's so important for parents to get to know their infant for the unique individual that they are, rather than thinking of them as more like others with the condition. Baby's personality will soon start to shine through so enjoy it. 6 - Did friends and family congratulate you on the birth of your baby? For so many families, the congratulations take a while to come in. People don't know what to say or do. Some even send condolence cards! But it's important to welcome all life into the world and celebrate just as you would with any other child. The cards are available direct from Fink Cards or on Amazon, priced £14.99, and I am very excited about the initial feedback from medical professionals and parents. We hope they will help make acceptance and positivity easier after a diagnosis, and will help parents nurture themselves as well as getting their baby off to the best possible start in life.